The blazes near Ballindalloch and in Dalmellington came as the fire service warned of an increased risk of wildfires. 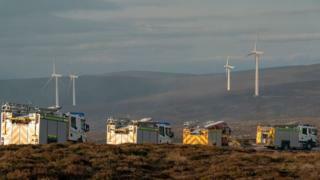 Six appliances and a special wild fire unit were called out to a blaze near Paul's Hill Wind Farm at Ballindalloch which broke out at 22:55 on Saturday. A total of 35 firefighters eventually extinguished the blaze at about 15:20. A helicopter was also brought in to waterbomb the area. Mark Loynd, group manager with the Scottish Fire and Rescue Service, told BBC Scotland: "The fire was initially on two fronts and the crews had to gain access to a very rough terrain. "It was in a very inaccessible location with very limited water supplies so most of the fire has been put out by firefighters using beaters and knapsack sprays to attack the heather that was on fire." The cause of the fire, which covered an area of about 1km sq, is being investigated. Mr Loynd added: "I would like to thank the crews who have been working very hard over a protracted period. "And although it's still cool in the Highlands and Morayshire, the risk of wildfire is quite high because everything is very dry. So I would ask members of the public to please take care during the holiday period and going into the Easter weekend so we don't get any more wildfires unnecessarily." The blaze in Dalmellington broke out in a forest near Loch Doon. It has been burning since Saturday - with about five miles of countryside alight. Firefighters, supported by Police Scotland and the Scottish Forestry Commission, have remained at the scene through the night. East Ayrshire Council has said "progress" was being made and that support was being offered for anyone nearby who had been affected.